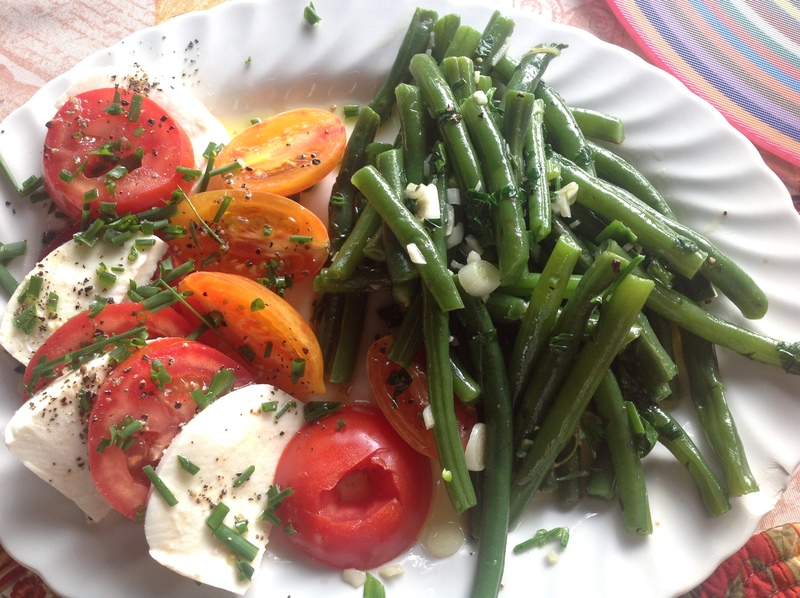 Recipes for easy French Summer Salads! Head to your city’s best market, come home, and make one of these great fresh French salads recipes. I’ve provided either the recipe itself or links with each so you can make them today. The French don’t eat sweet corn-on-the-cob with the love and gusto that we do, but they do enjoy sweet corn now and then. 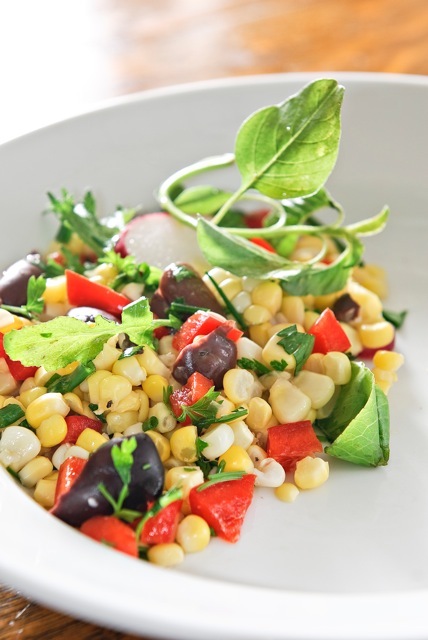 Here it is in a French Corn and Radish Salad–perfect for the season. 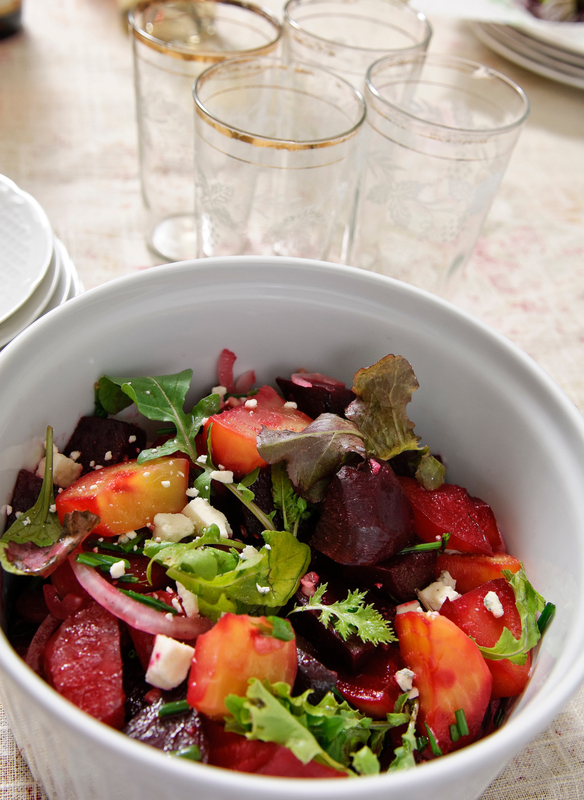 Shave prep time off this easy French salad recipe by purchasing pre-cooked beets in the produce aisle of the supermarket. Photo by Richard Swearinger. It’s peach (and nectarine!) 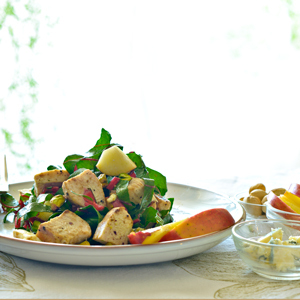 season–and both can be used in this lovely salad. Just be sure to find the freshest-best arugula you can find. The recipe and photo are courtesy of the Goat Cheeses of France. It stars a bloomy-rind style of goat cheese, sometimes referred to as Goat Cheese Camembert or Goat Cheese Brie. You can also use French goat brique, goat chabichou or another aged goat cheese. In a large bowl, add vinegar, olive oil, salt and pepper, whisking to combine. Add arugula, tossing to coat greens with dressing. Taste, and adjust seasonings as needed. Add peaches, pine nuts, and onion, tossing again to combine. Divide onto 4 plates. Divide the cheese into four quarters. 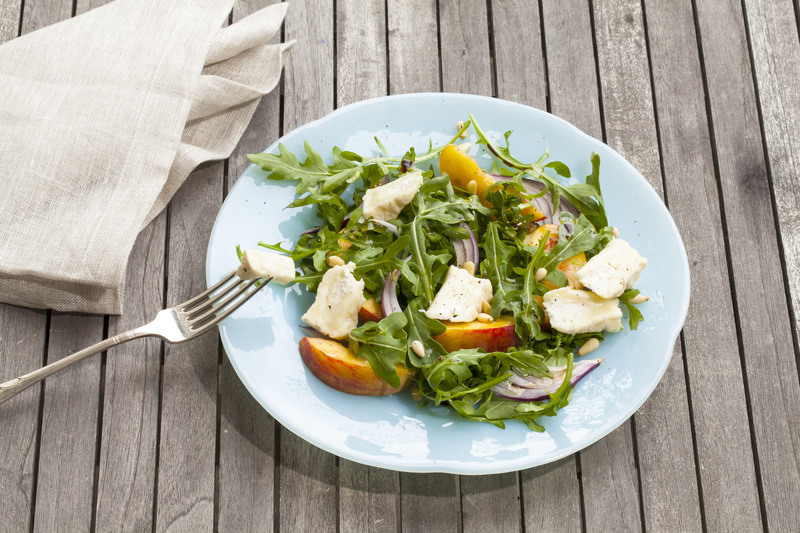 Slice each quarter of cheese, and place on top of each salad serving. Chard is totally in season right now at the farmers market. Take advantage. FAQ: What does Swiss Chard taste like? Will I like it? Answer: Do you like beets? Do you like spinach? If so, you’ll love Swiss Chard–the stems taste beet-like, while the leaves taste spinach-like, but with a depth of flavor all its own. Try it in this recipe, with some of those local apples that are just now making their way into the market. FAQ: What do the French call Swiss Chard? Answer: They call these lovely leaves blettes. Here’s the link to the recipe for French Swiss Chard Salad. One of France’s favorite ways with Swiss Chard is in a Tourte de Blettes (Swiss Chard Pie). See my recipe for Tourte de Blettes on my friend Richard Nahem’s site, EyePreferParis.com. Yes! This is even better with cute little haricot-verts. But you also can’t go wrong with some great locally grown green beans. I recently posted five easy French recipes for tomatoes, and judging from the number of times that this easy French salad recipe was pinned, I think this was the winner! At first glance, this is similar to #5, but while #5 is perfect side to a grilled or roasted meat, the Caprese could make salad No. 6 into a main dish. Simply add some bread and maybe cured meats, and call it dinner. Cook the green beans in boiling salted water for 5 to 10 minutes or until barely tender. 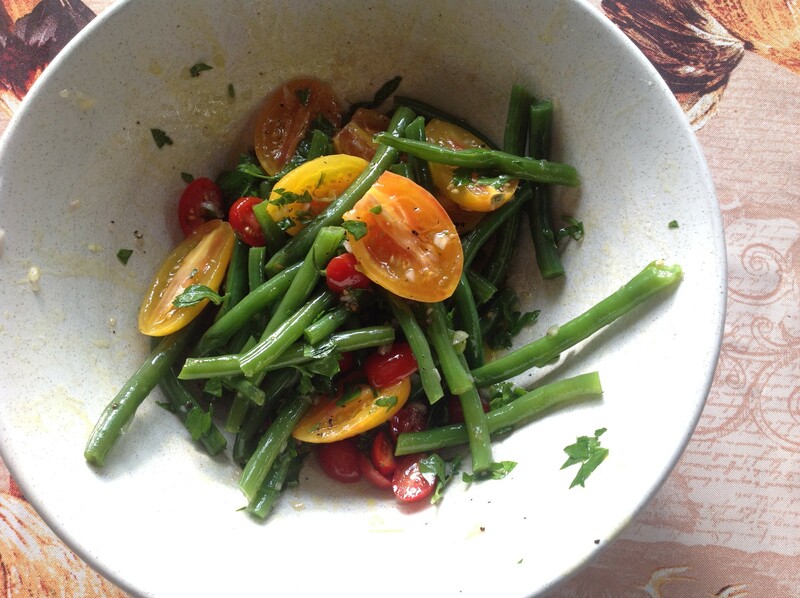 Drain well, then sauté the beans in 2 tablespoons olive oil with the garlic and green onions until crisp tender. Serve with Caprese salad, and season all to taste. Note: You probably don’t need a recipe for Caprese salad, but allow me to remind you that it’s all about the best ingredients you can find. Layer heirloom tomatoes withfresh mozzarella. Drizzle with a great olive oil. Sprinkle with fresh herbs (basil is traditional, though I also enjoy any fines herbes (tarragon, parsley, chives) on this as well). I hope you found this post helpful. If so, please consider supporting my work on this site. It’s so easy–and costs you nothing: Next time you want to buy something from Amazon, simply go to the Amazon site through one of my links or banner ads (such as the one below). No matter what you buy, I’ll get a small commission from your purchase–even if it’s not the item I’m advertising. Again, it adds nothing to your costs. So head to Amazon and look around! Thank you so much for your consideration. And thank you for visiting Chez Bonne Femme.